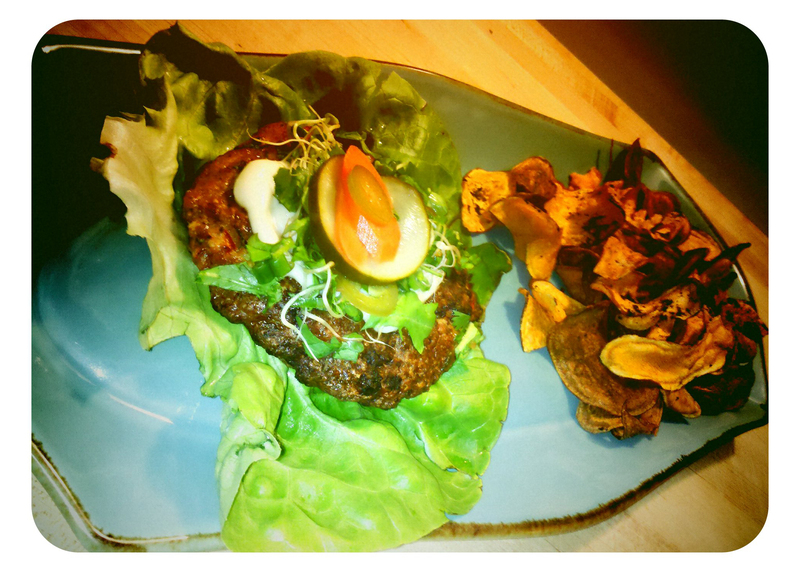 A Burger Worthy of a Top Chef | Kitchen Mischief! « Rachael Ray is Going Down! If you’re plugged into Bravo, you’re probably a fan of Top Chef. 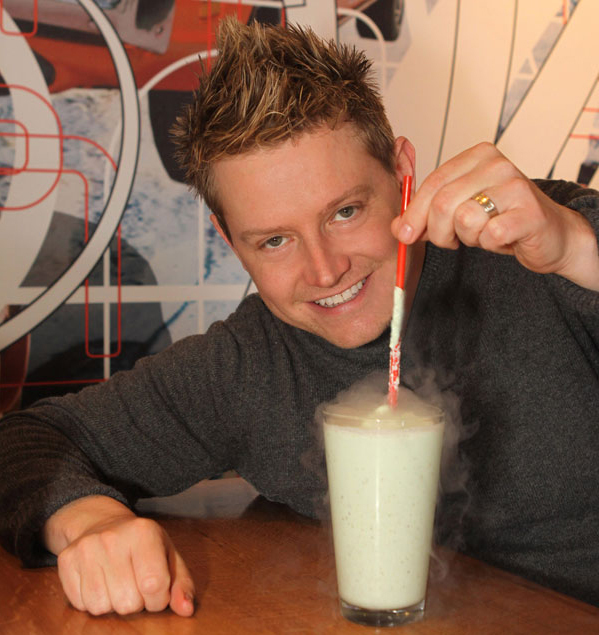 This week, Richard Blais, Atlanta restaurateur and co-owner of Flip Burger, is in the finals to be named Top Chef. It just so happens that I am in love with Flip Burger. The menu is flavorfully vast, inspired, and so much fun. I’ll include a link below so you can look around. Here's Richard — I'm so jealous of the faux-hawk. Seriously. Why does ground chicken gross me out so much more than ground beef? Seriously ... I am 37% more grossed out by these than beef patties. So odd. 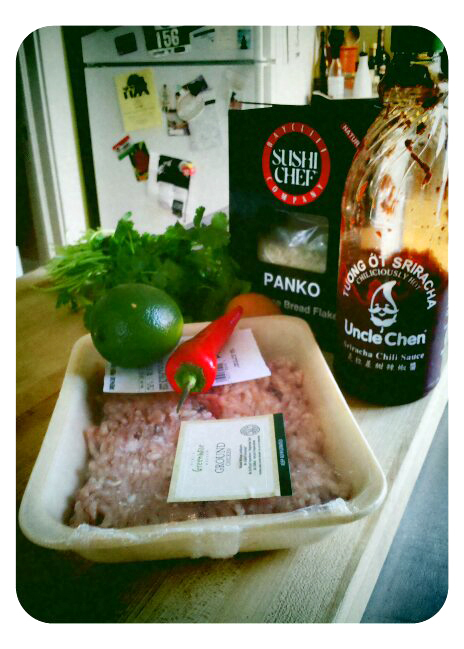 Mix all 87 ingredients together (except egg and panko). Add about half of the egg, then the panko. Shape into patties. They are going to be super-moist and pretty nasty feeling. Just do the best you can, and cook them on a clean, oiled grill. Note: Prayer is a viable kitchen utensil. Flip’s burger was topped with several culinary treats. First, there was some smoked mayonnaise. I was trying to imagine how you “smoke” mayonnaise. [My brain was flashing two competing, partially-formed images: Someone smoking a mayonnaise cigarette (GROSS!/ooh, new band name! ); AND — A jar of mayonnaise on a grill.] Once I shook these images out of my head, I thought, “Aha! 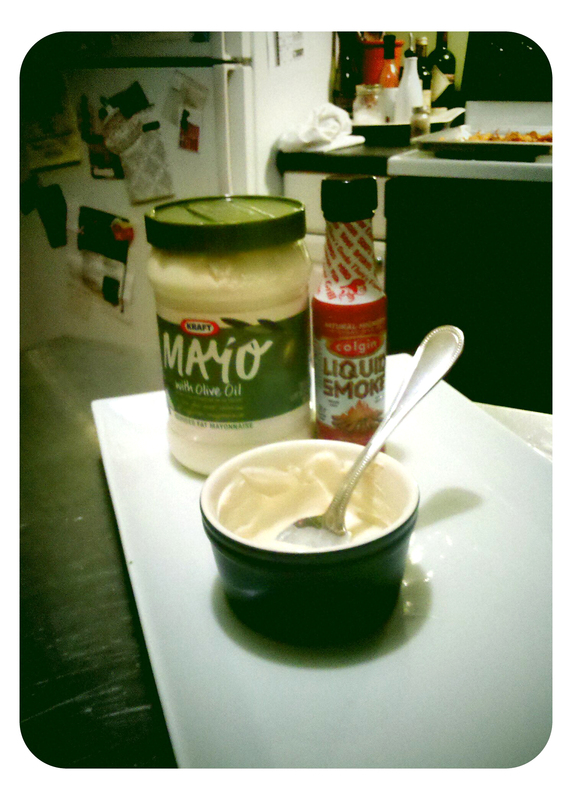 Mayonnaise + Liquid Smoke = Smoked Mayonnaise — brilliant!” If you want to make your own (and you should, because it is lovely! ), for each TBSP of mayo, add a few dashes of liquid smoke. Surprisingly delicious! It’s a great way to dress up your normal sandwich. The secret to great pickles is to make them in the morning. Flip tops their Spicy Thai with various and sundry pickled vegetables, like radishes and things. I remember this well because it’s how I ended up trying Mr. Spicy Thai in the first place. I had ordered some Argentinian burger thing, and my work-friend Katie ordered the Spicy Thai. When she got one whiff of the pickles, she was OUT. Apparently Katie is not a pickle fan. This worked in my favor, as I’ve never met a pickle I didn’t like. Anyway, back to the re-make. I couldn’t find carrot pickles anywhere, but I remembered Matthew’s quick pickle recipe, and figured I’d give it a try. 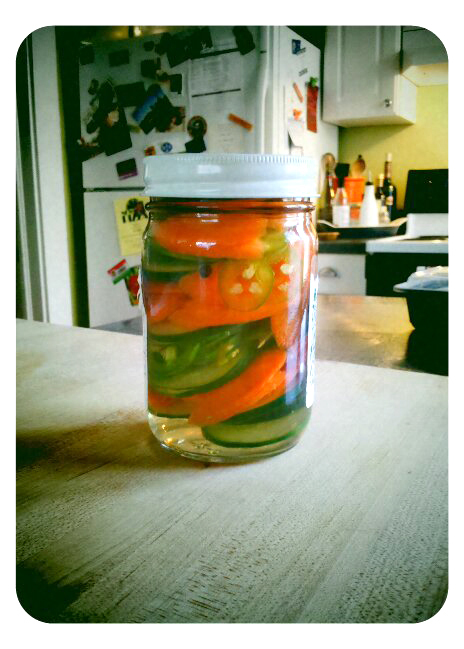 I used carrots, a cucumber, and a jalapeno. It was easy and really quick. Thanks, Matthew! Flip’s chicken burger was served on some kind of nice lettuce, instead of a bun. Was it Boston? Bibb? Butter? I don’t know. I was too obsessed with the burger part to pay close attention. And theirs was topped with some kind of small fancy salad. I do recall that sprouts were involved. That’s all I remember. So I grabbed a head of Butter Lettuce, some sprouts, and green onions. I served the burger on the lettuce, and topped it with a salad made of chopped arugula, cilantro, green onions, and sprouts, dressed with a dash of rice wine vinegar and lime juice. Meow! Three words: Sweet Potato Fries … plus two more words: Chocolate Salt. Flip serves these morsels of decadence that I simply cannot resist. However, due to my general squirreliness, I am not allowed to deep fry at home. It’s simply too dangerous and my short attention span is woefully ill-equipped to handle it. 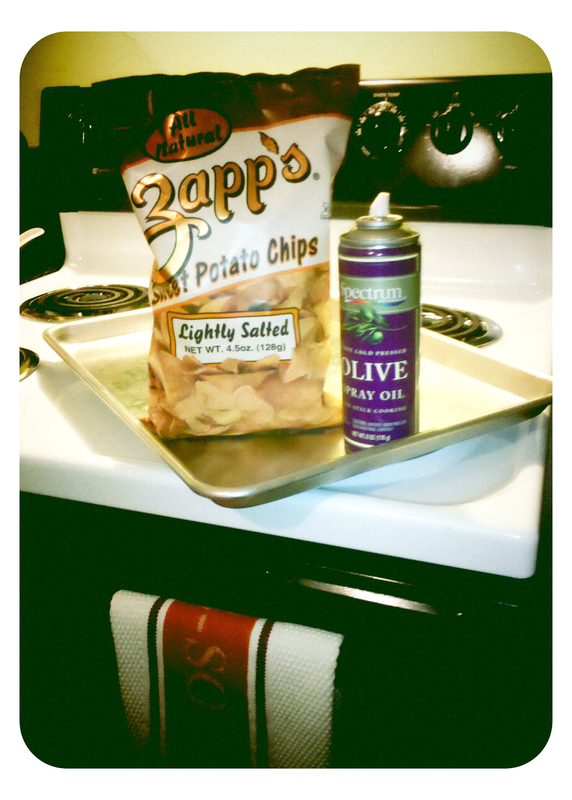 So, I decided to purchase a bag of Zapp’s Sweet Potato Chips (these are the best things EVER), spray them with olive oil, bake them for 8 minutes, then dust them with a mixture of sea salt and cocoa. So I did. And it was and absolute FAIL. Two things: I cooked them ENTIRELY too long. They went from delicious orange to mummy-skin brown. 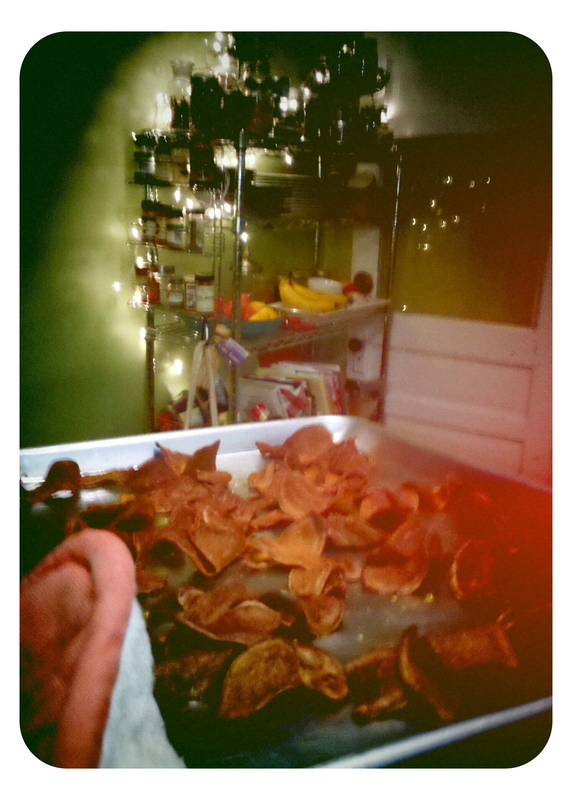 Oh, and it turns out you don’t need to re-salt potato chips, even if chocolate is involved. Deer were breaking into our kitchen and eating them off the pan. Swear to mischief. So even though they were a recipe fail, we still ate them (mainly because rare is the day when a chip crosses the threshold of our home). I whipped up another batch, this time cooking them for 4 minutes and topping with Chinese Five Spice. These were actually really delicious and I’ll be making them again. I was out of Five Spice, but I had recently been to the Indian store that sells bulk spices, so I decided to use my food processor to make my own. This was a near disaster. We were both concerned when the food processor began to smoke. I’m still not sure if it was burning cinnamon or electrical parts, but in the end, the concoction was complete. Note: This, along with the pickle cooking, occurred before 7 a.m. Hurry — look away before you get dizzy! So, that night, I cooked the burgers, made the salad, stirred up the mayo, and butchered the chips. And it was finally time to eat. 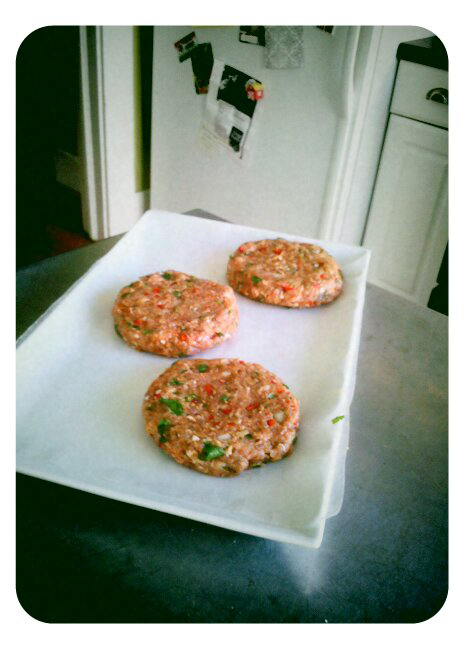 But first I had to assemble the burgers. First, the big leaf of lettuce. Next, the burger. Then, a spoonful of smoked mayo, spread thin over the top. Topped that with a pawful of the dressed salad, then sprinkled on a few of the pickles for fun. The picture’s not nearly as pretty as it tasted. I tell you what, this is the first culinary adventure I’ve taken in a while that I can say I will TOTALLY do again. Perhaps I will skip the pickle step, but everything else really was easy. And the burgers — seriously — were so good. Really guys — I’m not trying to toot my own horn. It’s just that I blow up so much stuff in the kitchen, so I get pretty damn excited when something works out! Anyway, in honor of Richard Blaise, who’s gunning it for Top Chef this week, either give this a try, or head out to Flip Burger and try it there. Either way, you will be a VERY happy camper! Thanks, Katie, for hating pickles and turning me on to this burger, and Good luck on Top Chef, Richard! PS: Check out the Flip menu here. This entry was posted on March 16, 2011 at 4:23 pm and is filed under Recipe, Uncategorized. You can follow any responses to this entry through the RSS 2.0 feed. You can leave a response, or trackback from your own site. Now do it vegetarian style? Black beans instead of chicken? And just to point out…this tasty morsel has been removed from Flip’s menu so unless we start a FB petition to bring it back…or an old fashioned sit-in, your best bet is to follow the Squirrel’s instructions and make it yourself. Good Luck!! It may cycle back on the menu…I am hoping for that. @Ben…I dunno. Black beans would be tricky. What about shrimp?